I wanted to thank Steve and Gaia for their beautiful reviews of the new Yin & Ylang on The Scented Hound and The Non-Blonde. Also thank you to Mark for including Cocoa Sandalwood on his list of favorite sandalwood scents. Mark is also writing an in-depth series on musk ingredients, starting with this post on the old nitro musks. I think many of you will find it to be an interesting series. I took my shopping cart down yesterday for just a brief unexpected break while I deal with a plumbing leak in my house that seems to be difficult to diagnose and repair. I’m camping out at my parents’ house a lot while parts of the plumbing and heat/AC are out of commission. I hope to have things under control within a few days. It’s in the upper 90’s today and an air conditioner would be nice, but luckily my parents’ house is available. It’s really gorgeous here right now though. The sweet peas and roses are blooming and I’m harvesting my first strawberries of the season. We’ve had a family of deer (a mother with two babies) living here for several years as the babies grew up, but now we seem down to just one. Not sure if it is the original mother or one of the now grown-up babies. She’s been hanging out here a lot lately and has become quite used to us, even taking naps by my garden fence under the shade of the oaks in the evenings. I was watching her graze on grass last evening just a few feet from the window. She keeps an eye on us but doesn’t get nervous unless we come too close. address for emails to the EU commission for those who wanted to voice their concerns. There is now a petition you can sign on parfumo.net if you would like a quicker way to make your voice heard than writing a letter yourself. It doesn’t take long to read and sign the petition if you agree with it. Many of you will have already seen the petition since it has been mentioned on numerous blogs and on Facebook, but I thought I’d post for people who have not seen it yet. 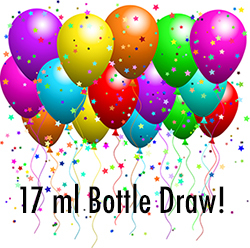 Nancy Knows posted a beautiful review of Yin & Ylang today on Cafleurebon, and they are hosting a drawing for a 17 ml bottle. You can head over to enter the drawing between now and Monday the 21st. The winners are announced on Cafleurebon a few days after the drawing ends, so be sure to check back for the follow-up post with the winners so you can email to claim your prize. Thanks, Nancy and Michelyn! I wanted to wish those who celebrate a happy holiday weekend. My brother and his family will be visiting; I’ve not seen them since Thanksgiving, so it’ll be nice to catch up. Spring has sprung here! The roses and pink jasmine are blooming, the sun is shining, green strawberries are starting to ripen, and birds are nesting in the eaves. Have a great weekend! Yin & Ylang is reviewed today on Now Smell This. Thanks so much, Jessica! Also, Tabac Aurea was enthusiastically reviewed by robes08 on Youtube. The Tabac Aurea part comes in at 23:09 but the video has a lot of fun reviews in it. Thank you, Marc-André! Samples and 5 ml of Yin & Ylang have been on the site this week, and I’ll be adding bottles any day now. I loved the line in this article about Frédéric Malle (Editions de Parfums) that says 350 is the number of iterations (mods) they typically go through for a scent. Makes me feel better about my norm of around 75-100. The final Yin and Ylang was mod 72B. I also appreciate that his advertising budget is zero and the money goes into the scents instead. We have rain, which is a good start on helping the drought, but it will warm up again by Sunday. The roses are already starting to bloom. Spring seems early here this year; I hope it arrives soon to those of you who have been hit by a hard winter.